It’s the classic road trip scenario: too much stuff and not enough room. Essential outdoor equipment is blocking the rearview window while boxes of food and sleeping bags sit atop passengers’ laps. No one is comfortable but they wouldn’t tell you, because they understand road trips aren’t supposed to be comfortable, right? Whether or not this situation is at all familiar, there is no question that extra storage room comes in handy on road trips, ski trips and moving days. No matter how big your vehicle is or how many passengers you have, there never seems to be enough room for what you want to do or the amount of stuff you want to bring. With more room up top, there’s ample room for more snacks, luggage, and people, meaning a second car on a road trip or a seemingly infinite amount of back and forth on moving day won’t be necessary. No one likes snowshoes in their face or a massive suitcase taking the place of a loved one during holiday travel season, so what gives? This is where the CURT Roof Mounted Cargo Rack comes in. Built for all kinds of cargo, this product is extremely lightweight and with two assembly pieces, incredibly simple to install. When purchasing a cargo rack, it is important to make sure the assembly is simple. If not, extra money could be lost in manual assembly or hiring someone else to assembly it for you. Compatible with most styles of roof rack base rails, this rack is usually—from assembly to installation—completely secure within twenty minutes and unlike similar racks, doesn’t feature a confusing amount of parts. It also features a simple extension option (sold separately) making it suitable for both outdoor and traveling experts and novices. Buyers report having used the product to store off-roading tires, as well as luggage and Christmas trees. Cargo racks like this one are ideal for storing large amounts of extra gear. Its simple design of this particular rack makes it suitable for a wide range of cargo and its walls allow for extra security, as they accept the straps or hooks of your average cargo bag or cargo net. This, in turn, makes it easier to pack up quickly and hit the road in record time. Of course, one of the most appealing features of this product is its price. Compared to other brands such as Smittybuilt, Thule and Yakima, the this product and its extension pack a serious bang for your buck. The product’s competitive price makes it especially appealing to those who want something dependable without having to break the bank. Potentially simple problems with the product are usually easy fixes, and even if a customer finds the product doesn’t have all the bells and whistles they are looking for, this product’s price and durability make it a noble competitor. Although the the product’s cons are few, there are nevertheless a few things to consider. The locking nuts (used to install the rack) are not of the best quality. Although these locking nuts have U-bolts with four wings suitable for hand tightening, some customers have reported that the screws supplied in the kit have been too tight to hand screw and therefore, prone to breaking. This type of locking nut is probably used in order to make the product more accessible to those without higher-end electronic tools. That said, this well-intentioned feature is not ideal. If this turns out to be a problem, however, a simple trip to the hardware store for regular locking nuts is just the remedy to smooth the installation process. If possible, nylon locking nuts are the best option to replace the supplied locking nuts. Even if the supplied locking nuts are not ideal, they are easy to replace from the get-go and are a minor annoyance considering the price and durability of the product. Another potential but rare issue with this product is the development of rust. Most people do not have a problem with this, but it seems the root of the problem is, once again, the supplied locking nuts. Buying better hardware is the key in preventing this problem. In the unlikely case of rust problems with the actual rack, a rust-preventing spray (also available at your average hardware store) is useful in preventing the development of rust. In addition, using a thread lubricant to protect the exposed threads (i.e. fasteners) along the tubing can also aid in preventing rust. In other minor complaints concerning the product as a whole, the assembly instructions are slightly confusing but far from impossible. The assembly itself is fairly self explanatory, so any confusing wording within the actual instructions only serves as a distraction from the facility with which this product is both assembled and installed. Needless to say, this particular rack may have its occasional defects, but in the end, always gets the job done. With its straightforward design and sturdy construction, it is the perfect product for someone in quick need of extra vehicular storage but also lasts from year to year. Although it is commonly said that you get what you pay for, this diverse product seems the exception to this rule. With a small financial investment, the customer reaps big benefits in the form of a cargo rack capable of supporting years of camping, travel and adventure. 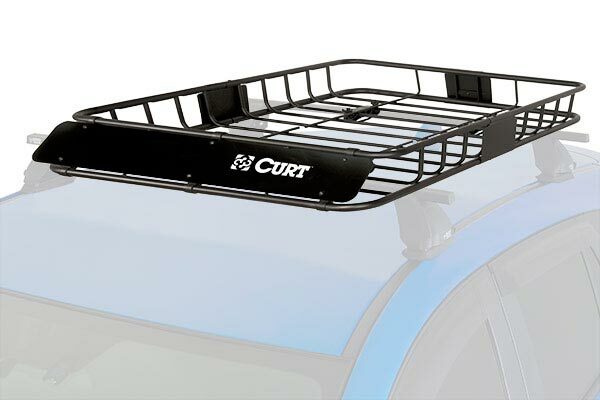 It might seem too good to be true but the testimonials say otherwise: one affordable purchase and carrying extra cargo in comfort just got a whole lot easier with the CURT Roof Mounted Cargo Rack.